Tender Morsels proofs are go! I had my first adventure with FedEx today—arranging pickup, not receiving. I had to get the FedEx man to do quite a bit of explaining and directing. FedEx, redesign your forms! So that they can be easily completed on top of a brick gatepost, by someone who needs +1.25 glasses but isn't wearing them, without her having to stand on a milkcrate to see the field names. I also posted off my Literature Board Fellowship Acquittal Report, months late but complete, and the financial part signed and sealed by an accountant. And I did some invoicing. And I prepared for next week's tech. writing work (from home). So I got to see something of the beautiful autumn day outside, but not a lot. I've got the first review for Tender Morsels in my hot little email Inbox. But I may not quote a word of it, until July. All I can say is, it's a good one. Which means that a lot of the on-tenterhooks feeling has just...evaporated. Phew. They're pouring in thick and fast, hey. ...this collection is one that needs to get out into as many hands as we can. Campbell and Aronson each write an introduction in which readers are informed about their preexisting views on war. While they are not opposite, it is rather like two sides of the same coin: different perspectives but with some middle ground of agreement. The book contains fantasy (a shivery and eerie story by Margo Lanagan), letters home from a WWI soldier, newspaper reports, first hand accounts, interviews, song lyrics (from Dylan's "Masters of War") and other forms. Candlewick is putting this out in September. UPDATED: And what turned up in the PO Box today? 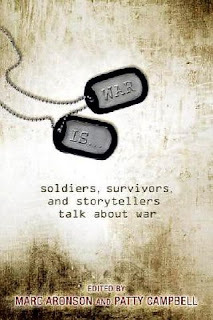 An advance reading copy of War Is.... Michael Cart says this book is 'indispensable reading for every young American', and Patty Campbell adds, 'We hope that reviewers in your country will also find it indispensable reading for young Australians'. It sure looks interesting. I'll let you know more about it when I've had a good dig and delve. Margo Lanagan revisits the Bavarian forests of the “Hänsel und Gretel” fairy tale in “The Goosle.” Lanagan takes an already dark story and elevates the darkness tenfold. Let’s just say that the title is not as innocent as it may appear. 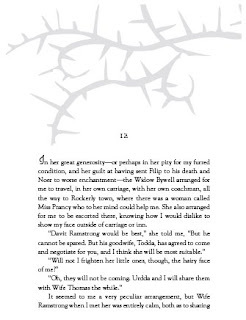 While in the original, Hänsel held out a bone from the cage in which he was trapped when the witch asked him to hold out his finger, the request and the response in this version are of a more adult nature. Not only do we have murder and attempted cannibalism, but also sexual slavery and bubonic plague to go along with it. Datlow uses the word “vicious” in reference to this story in the introduction; I couldn’t agree more. How deep into depravity the rabbit hole goes I’ll leave the reader to find out. Though I appreciated the creativity and inventiveness on display, I’m not sure the viciousness created a disturbing experience rather than an off-putting one. I finished up at the bank last week. That is to say, I'll still be working for the bank, but I won't be working at the bank, which makes a big difference. Just for a start, there won't be two levels of muzak (the broadcast version and the version squawking from the desk next door) and Ms Muzak clipping her nails, to think through. Whoever thought the open plan office was a good idea did not have tech writers on their mind at the time. Today I've been checking Tender Morsels page proofs, which was fun and funny, seeing some of the tangles the copyeditor and I had got ourselves into. D'oh! I meant to bring home the best marginal note to put here, but I brought a different swatch of pages home, for the read-through. Later, eh. We had a weekend at the beach—a walking, eating, drinking kind of weekend, not a swimming kind. Oh, we walked. Oh, we sat in the sun. Oh, the fresh air knocked us around and we slept, slept for so lo-o-ong. It was lovely. Thanks, Anne and Carson and Kate. Tomorrow I'm heading up to Varuna with my ex-(sniff)-editor Rosalind, to talk to the Residential Editors up there about Rosalind's and my roller-coaster of a professional relationship over the past...18 years. My God, it's been 18 years. Staying overnight in Katoomba, where there has been snow recently, and coming back Wednesday, when the fun and games continue. To which there's only one reply: ARC-ARC-ARC! Oh, but they're beautiful. And so weighty. It's very like what the Word spelling checker comes up with. Makes me feel awfully colourful. Have a look at him, reviewing Ellen's YBFH#20. "Winkie" by Margo Lanagan is a retelling of Wee Willie Winkie as something dark and angst-ridden and seems almost totally pointless. Of course, it wouldn't be that he's missed the point, would it. 'Course not; what am I saying. Oh, and even typeset it comes out at 435 pages. Don't throw this at the wall, people; you'll need to re-plaster. I've written ten pages this Draftbusters, and resolved to write 30 more before the next one on 7–8 June. This is for a 'short book' I've promised to write this year—not to be confused with the novella that's due around Christmas. I don't know that I'll be able to do much more than that, but that's not stopping me applying for money to buy time to try. Well, off I clattered down the broken road, into the rhythm of the rich man's days instead of the slow stodge of the walking soldier's. It was astounding how the country slipped by, rushed by, how shells of burnt cottages and cannon-craters and earthworks and shattered copses, instead of creeping towards a man and asking him to regard and consider how they had come into being, what they had weathered, and what had destroyed them again, leaped to my gaze, hurried by, gave onto the next dead farm, the next huddled family by their house of cloth and sticks, the next bloat-corpse of goat or donkey in the fields—I could see so far from up here! I could see, after a day or two with a night between at an inn with a good roast meal and two innkeeper's daughters, I could see how narrow a place in the world was occupied by the fighting. I rode right out of the war, I did, in the space of a day and a half, and I scarce knew what I was looking at when I saw my first ploughed field; I could scarce keep from laughing at the fool who thought he could bring up a crop in this world of poor luck and bombardment. Like quick, intense plunges into exhilarating waters, the stories in Lanagan’s latest, seductively eerie collection will seize readers’ imaginations with more off-kilter interpretations of folklore and startling eruptions of magic. Even more exciting, page proofs of Tender Morsels have been spotted, not exactly in the wild, but here and there in captivity. Even more exciting, it's the weekend, the Draftbusters weekend, and the day has been filled with writing and talking about writing, and I don't mean complex retail audit certificate procedures. 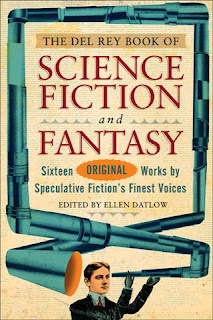 Reviews have been coming in thick and fast for Ellen Datlow's Del Rey Book of Science Fiction and Fantasy. Some of them mention 'The Goosle', some of them (shock-horror!) don't. Here is the round-up. Margo Lanagan’s “The Goosle” is a very dark retelling of Hansel and Gretel, everywhere harshly new. Margo Lanagan is in truly savage mood in “The Goosle”, a revision and continuation of the story of Hansel and Gretel, in which the tale’s origins in poverty and plague are foregrounded to chilling effect, cannibalism, paedophilia, and all. 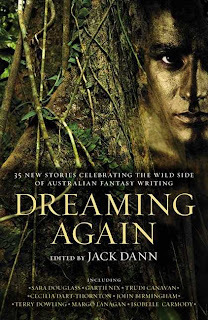 Richard Bowes has an okay story followed by Margo Lanagan with a clever twist on a fairy tale. To lesser effect [than Maureen McHugh's 'Special Economics'], Margo Lanagan reimagines the “Hansel and Gretel” fairy tale as “The Goosle,” with a disturbing sexual bent (”Show me your boy-thing,” the mudwife would say. “Put it through the bars”). The high point of the collection is Margo Lanagan's The Goosle, a dark and twisted Hansel and Gretel retelling, involving mass murder, the bubonic plague, and sexual slavery. When am I going to get to see all these other stories? Excellent news for working walking writers! Well, in January next year, I'll be the workshop leader on a creative walk with Into The Blue in the Tarkine rainforest, in Tasmania. Raymond tells me that they've put up more platform walks, so there'll be less actual slogging through the bush, and more leaning over the railings being inspired. I'm not quite sure how the days will be organised, but I'm going for a practice walk with Jan Cornall in the desert at the end of June, to get an idea of how she runs hers. I heard wonderful things about her Tarkine walk over the New Year this year (watch the slideshow here for a glimpse), and she's doing another one just before mine, but mine is specifically for speculative fiction writers, so if you want to throw some wild ideas around with me in the bush this southern summer/northern winter, book now! Resist if you can. Personally, I think there'll be more fun than you can poke a stick at. Russian deals are in the offing for Tender Morsels and Red Spikes. Ast wants to put Red Spikes stories in with Black Juice ones - so that the result will look more like a Russian novel, eh. No haiku today, either. But at least I've been talking about writing. Oh, and making such progress on retail audit certificates, you wouldn't believe. I see I need to put a picture up soon. That beer bottle can't last forever. Well, they never can, can they? except banking procedures, which I'm cranking out 8 hours a day. Oh, and a little bit of spaceship story for Mr Strahan - but really, so little it hardly counts. Even the notebook is lying idle. I'm not even reading on the train any more, let alone writing. Things have come to a pretty pass when a person can't dredge up a haiku.